BD are monthly events (excluding off-season and when substituted by special events). 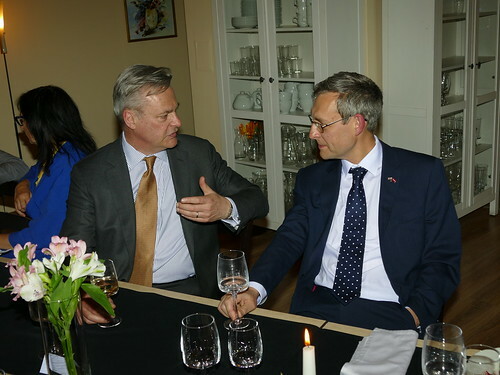 As prominent speakers at monthly dinners UK and Latvian high rank officials, business owners, senior level managers or analysts on topical issues are invited. Attendees have the opportunity to ask questions to the speaker. BD is one of the most formal BritCham events, consisting of networking during welcome drinks that gives an opportunity for the guests to meat the speaker and event attendees which is followed by a seated 3 course dinner with wine. 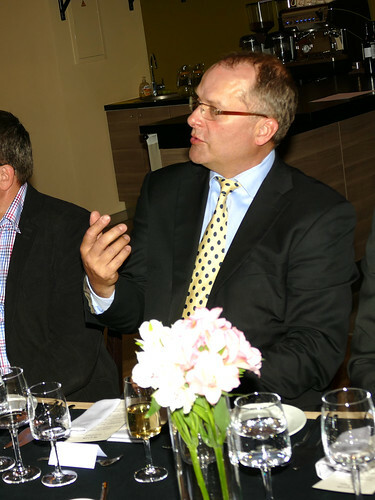 Dinners are held at different places, hotels and restaurants, that are BritCham members. Monthly dinner is a paid event with price difference for members and non-members. Every Platinum member has a free seat at each Monthly Dinner. BAH is an informal event which is sponsored by and held at one of BritCham member’s premises. It is an opportunity for BritCham members to show and tell about their business in detail and for other BritCham members to get to know their fellow members even better. Members are welcome to organize also joint BAH with another member, if they find it would add value. BritCham will happily assist with practical advice. BAH usually consists of networking during welcome drinks, company activities presentation, tour of the premises, entertainment for attendees followed by a reception. BAH is free, member only event. This event is an excellent opportunity for the new members to present themselves to the British Ambassador and other members. This is also an occasion for existing members to get to know the newcomers. NME usually consists of networking during welcome drinks, welcome from the Ambassador and BritCham Chairman, event supporter’s presentation, members' presentations followed by a reception kindly sponsored by one of the BritCham members. NME is free, member only event and it is held at a the British Ambassador's residence. PCB is an exclusive event – a breakfast with the British Ambassador with an opportunity to discuss topical issues or meet special guests. PCB are irregular, free events, open to Platinum level members and supported by the British Embassy. Platinum members have the option to set the topic of the event. CCO is a traditional annual BritCham event which opens the BritCham season in the first half of September. Teams enter the cook-off and prepare a curry to bring to the event for attendees and judges to taste and select the winners. Teams are asked to introduce themsemves and present their curry, and encouraged to do so in a creative way. CCO usually consists of networking during welcome drinks; BritCham Chairman's welcome, introducing judges, presentations of the curry teams, tasting the curries and awarding ceremony. During the evening there is usually henna artist's station and a traditional BritCham raffle. Jury consists of 3 judges. There are 4 prizes – 3 winners selected by the jury and a Guests' Favourite prize voted in by all attendees of the evening. CCO is a paid event; price differes for members and non-members. Free for teams of 2 persons entering the curry cook-off. LN is an event for BritCham ladies to spend an evening in a friendly atmosphere with girl talk and entertainment exclusively for ladies. LN is free or a small fee event and usually consists of networking during welcome drinks, tour of the venue, activities and a reception. CP is traditionally held at the British Ambassador's residence and some years it is a themed evening. CP usually consists of networking during welcome drinks, welcome by the British Ambassador and BritCham Chairman, short church service by reverend of an Anglican church, carol singing, proper English Christmas dinner and BritCham Christmas raffle. Attendees are welcome to bring their families and children with them. At the evnet there's usually a children activities corner. CP is member only event and it is held at a the British Ambassador's residence. Burns Supper is BritCham event with the longest traditions. This is the largest annual charity ball in Latvia gathering up to 200 attendees every year and supporting different charity projects since 1997. Burns Supper is a long and exciting evening - it is one of a kind and very Scottish. Agenda includes networking during welcome drinks when guests in addition to meeting new and well-known people and having cocktails can enjoy taking pictures at a photo corner, listening to bagpipes and purchase raffle tickets for the largest charity raffle of the year. When people take their seats, food are served that is accompanied by excellent speeches filled with good humor followed by the famous Scottish dancing and the grand raffle prize drawing. Evening seems endless and often it continues in Riga’s pubs and clubs (the ones that stay open very late). To help to enjoy Scottish dancing in full during the evening, BritCham offers several Scottish dancing lessons for free to Burns Supper attendees. For last 5 years Burns Supper has been held at Radisson Blu Daugava Hotel. Burns Supper is a paid event, and there are several price options available from individual to table for 10 persons. Contributing table is also an option – for those willing to support BritCham activities and looking to have the best location for their table. BritCham AGM is held every year in March and is an opportunity for members to hear what has been achieved during the year and BritCham plans for the coming year. During AGM new board members are elected. Every member can stand for BritCham Board. AGM is usually held at the British Ambassador's residence and its agenda includes: light breakfast networking, welcome by the Ambassador and BriCham Chairman, Reports, Board member candidate presentations, elections & a group photo of the new Board. Two years in a row BritCham closed its season with a Royal Ascot Party at the British Embassy garden. These events were filled with specific Ascot activities such as live streaming of Royal Ascot Ladies Day from London, demonstrations by a dressage horse and many more. In 2017 a British Garden party to celebrate the Saphire Jubilee was held. There is a dress code for the event, including hats or headpieces for ladies. It is not compulsory but attendees are encouraged to follow it and as the experience shows people do like to dress up. There is also a hat competition held during the event, fashion shows by Karen Millen, Oasis and Laura Ashley, and professionals from Mirage Jazz Orchestra entertain attendees of events with live music. Paid event, member and non-member tickets differ in price, couple and family tickets available. Kids activity corner available for children. BritCham season is closed from mid June to September, and to give BritCham members an opportunity to meet their fellow members during the off-season BritCham has invented ISG. It is held once a month in June, July and August at one of our member’s venues. It is a very informal event with no official content at all - people come and meat each other. Registration for the event is required only as means for the host to know how large a space is equired but people may arrive also without registration. ISG host usually offers a free welcome drink, special BritCham offer or similar. Please note that attendees pay at the venue for food and drinks they consume. 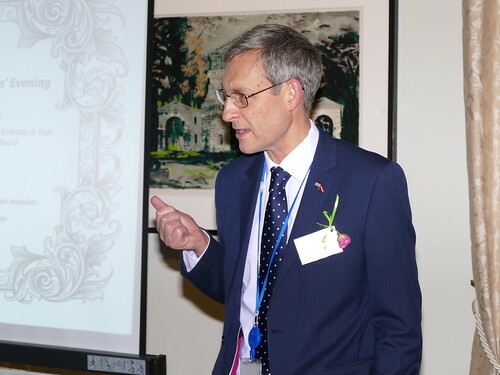 In autumn 2018 BritCham launched new members-only series of informal breakfast events which are held on the first Thursday of the month (from October - April) and takes place in one of the Radisson Blu Hotels in Riga. These are interactive roundtables on various topics for like-minded businesses/individuals to share their knowledge and experience and discuss topical issues over breakfast at the start of the working day. Each event has a discussion leader, but the aim of this series is, as indicated, for our members to share their experience and ideas. Members are welcome to sponsor any of events relevant to their industry or interests.